Deep in the inner ear of mammals is a natural battery—a chamber filled with ions that produces an electrical potential to drive neural signals. In today's issue of the journal Nature Biotechnology, a team of researchers from MIT, the Massachusetts Eye and Ear Infirmary (MEEI) and the Harvard-MIT Division of Health Sciences and Technology (HST) demonstrate for the first time that this battery could power implantable electronic devices without impairing hearing. The devices could monitor biological activity in the ears of people with hearing or balance impairments, or responses to therapies. Eventually, they might even deliver therapies themselves. In experiments, Konstantina Stankovic, an otologic surgeon at MEEI, and HST graduate student Andrew Lysaght implanted electrodes in the biological batteries in guinea pigs' ears. Attached to the electrodes were low-power electronic devices developed by MIT's Microsystems Technology Laboratories (MTL). After the implantation, the guinea pigs responded normally to hearing tests, and the devices were able to wirelessly transmit data about the chemical conditions of the ear to an external receiver. "In the past, people have thought that the space where the high potential is located is inaccessible for implantable devices, because potentially it's very dangerous if you encroach on it," Stankovic says. "We have known for 60 years that this battery exists and that it's really important for normal hearing, but nobody has attempted to use this battery to power useful electronics." The ear converts a mechanical force—the vibration of the eardrum—into an electrochemical signal that can be processed by the brain; the biological battery is the source of that signal's current. Located in the part of the ear called the cochlea, the battery chamber is divided by a membrane, some of whose cells are specialized to pump ions. An imbalance of potassium and sodium ions on opposite sides of the membrane, together with the particular arrangement of the pumps, creates an electrical voltage. Although the voltage is the highest in the body (outside of individual cells, at least), it's still very low. Moreover, in order not to disrupt hearing, a device powered by the biological battery can harvest only a small fraction of its power. 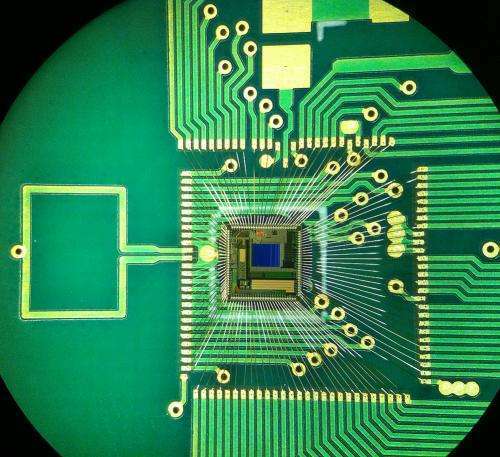 Low-power chips, however, are precisely the area of expertise of Anantha Chandrakasan's group at MTL. 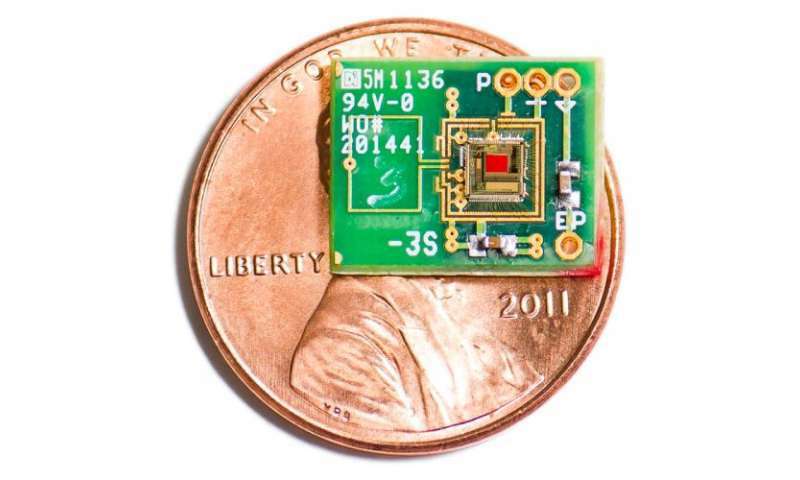 The MTL researchers—Chandrakasan, who heads MIT's Department of Electrical Engineering and Computer Science; his former graduate student Patrick Mercier, who's now an assistant professor at the University of California at San Diego; and Saurav Bandyopadhyay, a graduate student in Chandrakasan's group—equipped their chip with an ultralow-power radio transmitter: After all, an implantable medical monitor wouldn't be much use if there were no way to retrieve its measurements. But while the radio is much more efficient than those found in cellphones, it still couldn't run directly on the biological battery. So the MTL chip also includes power-conversion circuitry—like that in the boxy converters at the ends of many electronic devices' power cables—that gradually builds up charge in a capacitor. The voltage of the biological battery fluctuates, but it would take the control circuit somewhere between 40 seconds and four minutes to amass enough charge to power the radio. The frequency of the signal was thus itself an indication of the electrochemical properties of the inner ear. To reduce its power consumption, the control circuit had to be drastically simplified, but like the radio, it still required a higher voltage than the biological battery could provide. Once the control circuit was up and running, it could drive itself; the problem was getting it up and running. The MTL researchers solve that problem with a one-time burst of radio waves. "In the very beginning, we need to kick-start it," Chandrakasan says. "Once we do that, we can be self-sustaining. The control runs off the output." Stankovic, who still maintains an affiliation with HST, and Lysaght implanted electrodes attached to the MTL chip on both sides of the membrane in the biological battery of each guinea pig's ear. In the experiments, the chip itself remained outside the guinea pig's body, but it's small enough to nestle in the cavity of the middle ear. Cliff Megerian, chairman of the otolaryngology department at Case Western Reserve University, says that he sees three possible applications of the researchers' work: in cochlear implants, diagnostics and implantable hearing aids. "The fact that you can generate the power for a low voltage from the cochlea itself raises the possibility of using that as a power source to drive a cochlear implant," Megerian says. "Imagine if we were able to measure that voltage in various disease states. There would potentially be a diagnostic algorithm for aberrations in that electrical output." "I'm not ready to say that the present iteration of this technology is ready," Megerian cautions. But he adds that, "If we could tap into the natural power source of the cochlea, it could potentially be a driver behind the amplification technology of the future."